I have long been interested in education in the developing world and the decentralization of decision-making in these regions. My initial perspective was in favor of decentralized models for the purpose of supporting sustainable and locally relevant economic development. Further investigation into this topic through coursework and my personal research has pushed my thinking. In this post, I would like to define decentralization in this context and consider some of the issues that arise in programs of decentralization. Decentralization can take the form of deconcentration, where responsibility but not authority is shifted to the local level; delegation, where real power is given to the local decision-makers, but the central authority maintains a unified vision and direction; and devolution, where the local schools have true autonomy (Lai & Lo, 2006). The World Bank, which encourages decentralization in its educational initiatives, considers decentralization as a continuum, with most systems located in the center between the extremes of schools occupying only an advisory role and local groups having complete control (Patrinos, 2011). Generally, the power that is generally decentralized is decision-making regarding the allocation of funds and the selection of personnel. However, the decentralization of curriculum decision-making, which is particularly interesting to me, is rarely present at a systemic level (Ziba, 2011). Examples of this type of decentralization are more anecdotal, although they do report success (e.g. Arenas, 2008; Gershberg, González, & Meade, 2012). These efforts are responsive to the local context; although they may not produce higher test scores on internationally recognized assessments, they do increase the quality of life for the students and the surrounding community members. For example, as described by Arenas (2008), the local community in Peñoncito, Columbia leveraged their local decision-making power to shift the curriculum in their schools towards being focused on agricultural and business skills that allowed the students to contribute to the local economy while learning the skills they need to be successful in their local context. In developing communities, decentralization means that communities that have been disempowered through colonialism are able to take control over how outside resources are allocated. Shifts towards local control have increased community involvement and enrollment (Chikoko, 2009). This type of management has also pushed systems to become more efficient and cheaper overall (Patrinos, 2011). However, ceding control over schools to the local community can lead to problems of political conflict (Edwards, 2011) and surface-level reform without real structural changes (Lai & Lo, 2006). As these communities continue to work under the watchful eye of larger development initiatives, they may create a façade that is pleasing to these overseers. The promise of meaningful reform though decentralization continues to draw my interest. In developing contexts, meaningful decentralization may be a way to counter colonial practices and structure systems based on local needs and realities (Essuman & Akyeampong, 2011). However, in practice these efforts often contribute to greater inequality, such as when important stakeholders such as teachers or parents are excluded from the decision-making process, or processes like human resources decisions remain centralized (Chikoko, 2009; Toi, 2010). Clearly, the histories and current realities of of developing regions must be deeply understood when creating and conducting educational reform. Local stakeholders, with their knowledge and connections, should drive these efforts. As a research community, perhaps we can help understand, facilitate, and disseminate these efforts. Arenas, A. (2008). Connecting Hand, Mind, and Community: Vocational Education for Social and Environmental Renewal. Teachers College Record, 110(2), 377–404. Chikoko, V. (2009). Educational Decentralisation in Zimbabwe and Malawi: A Study of Decisional Location and Process. International Journal of Educational Development, 29(3), 201–211. Decentralized decision-making in schools: the theory and evidence on school-based management. (2009). Washington, DC: The World Bank. Edwards, R. M. (2011). Disconnect and Capture of Education Decentralisation Reforms in Nepal: Implications for Community Involvement in Schooling. Globalisation, Societies and Education, 9(1), 67–84. Lai, M., & Lo, L. N. (2006). Decentralization and Social Partnership: The Development of Vocational Education at Shanghai and Shenzhen in China. Educational Research for Policy and Practice, 5(2), 101–120. Patrinos, H. A. (2011). School-Based Management. 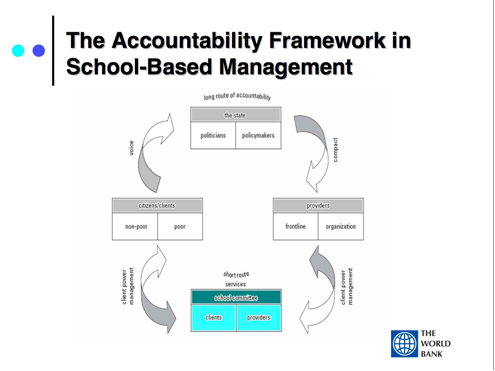 Making Schools Work: New Evidence on Accountability Reforms, 87–140. Toi, A. (2010). An Empirical Study of the Effects of Decentralization in Indonesian Junior Secondary Education. Educational Research for Policy and Practice, 9(2), 107–125. This entry was posted in Research Directions and tagged decentralization, International education, policy by Mark W. Olofson. Bookmark the permalink.